Magic tracks are your child's new best friend. These are pieces of tracks that are connected to each other to form a race course of different shapes every single time. Gone are the days of straight, stiff pieces. Bring home this new toy which is sure to be a hit with your children. The track pieces can be bent, flexed and curved in any direction creating new pattern thus keeping it interesting and innovative for your children all the time. According to the infomercial, with this product, children can create new race course patterns every time. The new Serpentine Technology involves track pieces to be connected to each other which, in turn, can be twisted in any direction to create new race course shapes and patterns. It is also claimed that the tracks' neon colors make it glow in the dark. The cost of Magic Tracks is $29.99 plus $6.99 shipping. The special TV offer allows you to receive a second Magic Tracks by paying the extra shipping fee of $6.99 for a total price of $43.97. This feature involves snapping the pieces together to form new track courses. As the car races down the tracks, pieces can be disconnected and joined back together to form new design. The newly built tracks can go under the bed, over the chair, over a mountain or in a 360 degree pattern. There are no limitations to creating patterns as every time the course changes, a new design evolves thus helping children to be more innovative. Neon track pieces that are a part of the package, glow in the dark and shine very bright. The car that comes along with the kit has 5 inbuilt LED lights which lights up the track as it moves down the course. So turn off the lights and enjoy as the car speeds down the glowing course. A set of decal stickers and a guide book is also included in the set. 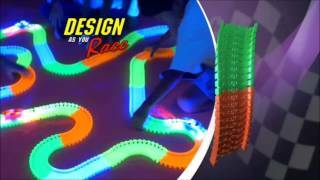 The decals can be used to decorate the car and the guide has many race course patterns included in it to create new challenges for your child to piece together. Magic tracks are very convenient to store. After the children are done playing, the tracks can be neatly rolled up and stored. No more scattered pieces lying around the room. You no longer require huge boxes to stash away the bits. The children can roll it up themselves and store it under the bed or in their cupboards as it hardly takes any space. Absolutely hassle free. As easy as storage can be, so is portability. The rolled up track pieces can be easily stored away in the travel pouch that comes along with the kit. Children can take it anywhere whether a picnic or a holiday as it easy to put assemble and dismantle it. Magic tracks have 220 pieces which are connected to each other to create a customized speed way. The car that comes along with the set is battery powered and is lit by 5 LED lights which illuminate the neon tracks as the car goes around the course. These track pieces can be disconnected and snapped back together to form new designs in different shapes. The Serpentine Technology enables the pieces to be more flexible in their form as the tracks can be twisted and curved in any manner without breaking off from their joints. It is extremely simple to assemble Magic Tracks. Just take the track pieces and connect them together one by one to form a speedway for the car. The pieces can be removed and joined again in different places to create new patterns. Track designs can also be created over and under furniture to make new courses, thus resulting in new designs every time. After use, the track pieces need not be taken apart. They can be rolled up and stored away in the travel pouch just as they are, making it easy to use the next time. Magic Tracks is available for sale on most leading online websites. Though the product is a hit among the kids, it has mixed reviews from the customers. Magic tracks have an average rating of 3.5 out of 5 stars. Therefore, it is clearly not a scam as many customers were extremely happy about the product as it delivered what it claimed. It is the perfect toy for your children, and not just as gifts on special occasions. On the downside, customers complained about the order not being delivered on time. People ordered the toy online and were promised that they would receive it within 3 weeks whereas it took 45 days or more for the package to arrive. The price also is on the expensive side due to shipping costs when compared to the store bought version. Some customers also quoted that the toy may not be safe to use by children as they suspected that the plastic can be toxic and that the luminescence exposure might not be healthy for children. Although Magic Tracks has good reviews among customers, it is a look alike of its counterpart named Mindscope Neo Tracks. The latter one has more reviews and is less expensive than the former. Neo tracks is also said to be equipped with more track pieces of 258 in number compared to 220 pieces, and is claimed to be cheaper. Although Neo tracks were cheaper, customer reviews did reveal that the quality was not good as they expected. They stated that the track pieces were not made of good quality plastic and that they broke easily. Customers also mentioned that some of the pieces were badly designed and the flexibility of the product was lost as pieces could be disconnected to create new paths over house furniture. It is friendly for kids of all ages as snapping the track piece together is all the effort that is required. 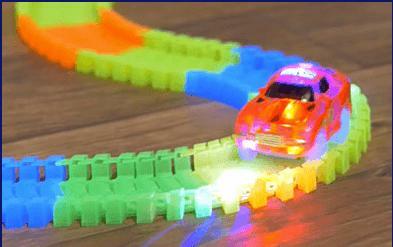 The glowing car and the tracks act as an extra bonus- indeed a fun-toy for children. No doubt kids love it! If you are worried about your kids going out to play in the rain, and want to stop it, this great toy can serve the purpose. Children will want to stick to their new toy ( Magic Tracks ) and stay indoors rather than going out to play.